Location: Situated in the centre of Llangranog to the S of the B4321 and near the junction of that road and the B4334. 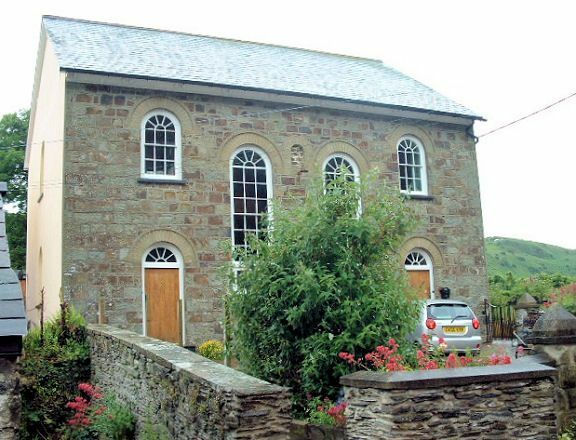 Calvinistic Methodist Chapel, built 1863 for £410 with alterations of 1872. Disused 1995. Squared sandstone with slate roof and paired bracket eaves. Cut sandstone voussoirs to arched heads. Lateral facade of two long centre windows, two outer gallery windows over ledged doors with fanlights. Blank centre recess for plaque between main windows. All windows are small-paned with radiating bar-heads. Rendered end and rear walls. One small central gallery window and one small central ground floor window at each end. The rear has six similar, three at gallery level and three at ground floor level. A well-proportioned late example of the lateral fronted chapel, in a prominent position. Situated above and to the S of Llangrannog beach. Situated some 1.5km E of the coast at Llangrannog on the S side of the Nant Hawen valley.